The US is an incredibly violent country historically, both internally and externally. And the average citizen has an amazing tolerance for that violence. Check out these two articles. The first is Violent Rightwing Rhetoric Doesn't Kill People. People Living in a World Where They Hear A Lot of Violent Rightwing Rhetoric Kills People posted at BradBlog. Instead of snipping it, I’ll re-post the wanted poster that Brad Friedman highlights in his article. 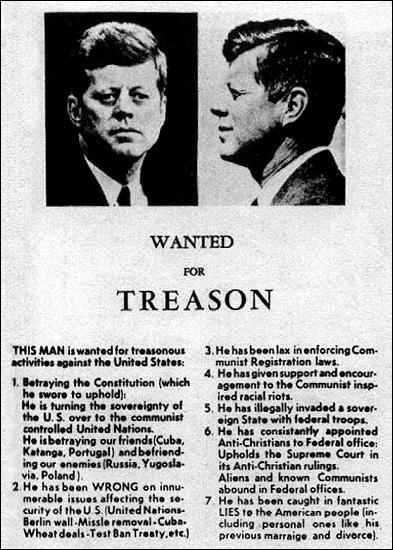 This was circulated just days before JFK was assassinated. The gun-toting Right is at it again. And it’s not just Sarah Palin and her crosshairs. Read about it in the BradBlog article. The second article has become so popular that the FAIR (Fairness and Accuracy in Reporting) server became overloaded. Here is a another link to the article using the Google Cache: Fox News: The No. 1 Name in Murder Fantasies (11/10/2010). Bill O'Reilly's recent "joke" about decapitating Washington Post columnist Dana Milbank was only the latest example of a demented Fox News culture that permits on-air personalities to fantasize about assassination and other forms of violence against those deemed enemies of the station, its personalities or their worldview. It would be very convenient for Fox if the Arizona shooter could be tied to some particular radical right-wing group, but so far that does not appear to be the case, despite their early report. You might want to also check out Giffords Opponent, Jesse Kelly, Held June Event to “Shoot a Fully Automatic M16″ to “Get on Target” and “Remove Gabrielle Giffords” (Firedoglake, 1/8/2011). Sarah Palin, infamous for the controversy earlier this year when she urged followers to “reload” and “aim” for Democrats on a list of targeted races she placed in crosshairs. It’s too late for Palin to try to erase her web pages and tweets because they’ve already been widely reported. A clear target of the right-wing kill rhetoric has been the first African-American president of this country, Barack Obama. All they have to do is keep it up. There are enough guns-toting nuts out there that sooner or later someone will fulfill their wishes. Of course, since they did not pull the trigger personally, they will not chastise themselves on the air with remorse and suddenly become gun control converts. I believe that FOX News should lose its license to broadcast immediately. Also, it is apparant that allowing any American news media to be owned by non-Americans(Murdock,Black, etc.) is harming our Democracy and destroying the Constitution. The Arizona Sheriff Duphiks remarks about this senseless killing, this senseless disregard for human life as a result of the rheteric is correct. The President should keep the flags at half-mast until our country is sane. We need Rep. Kucinich's Department of Peace established now....without delay. To assign the act of this mentally unstable murderer as the result of political rhetoric is of incredibly poor taste especially since none of the facts of the case have been reported. By doing so you further incite political divisiveness. I don't know what's more troubling, that you believe the Right is somehow responsible, or that extreme Leftists are somehow exclusively pacifist. Neither is true. When it comes to senseless violence, the Left is consistently far more extreme than the Right. It's not conservatives that participate in rioting and looting parades. Larry, you're part of the group that's making this worse, not better. This guy is a nut and that's it. To connect this to political activity is harmful at least and dangerous at worse. Look at the previous comment advocating eliminating free speech and and forcing "peace" upon everyone else. This is not "disappeared news". It's more like "fabricated news". Poor job, Larry. You'd do good by deleting this post altogether or putting forth some kind of retraction. I disagree with the folks claiming this is not news... It IS news when violent rhetoric results in violent acts. That is so clearly the case here. Both Palin's 'target' gunsights and her opponent's urging people to pickup an M16 gun to get rid of Giffords were completely out of line!